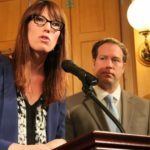 Clyde is calling on Governor Kasich and Secretary of State Husted to act swiftly to put this new funding to work as soon as possible. Complying with HAVA’s requirements for voting systems, provisional voting, and the statewide registration database. Improving the administration of elections for Federal office. Educating voters concerning voting procedures, voting rights, and voting technology. Training election officials, poll workers, and election volunteers. Improving, acquiring, leasing, modifying, or replacing voting systems and technology and methods for casting and counting votes. Improving the accessibility and quantity of polling places, including providing physical access for individuals with disabilities, providing nonvisual access for individuals with visual impairments, and providing assistance to Native Americans, Alaska Native citizens, and to individuals with limited proficiency in the English language. Establishing toll-free telephone hotlines that voters may use to report possible voting fraud and voting rights violations, to obtain general election information, and to access detailed automated information on their own voter registration status, specific polling place locations, and other relevant information. If Ohio acts urgently, funds could be in-house by mid-May, in time to make improvements for the fall election. Given well-documented cases of election interference by hostile state actors, and the state’s aging election infrastructure, it’s more urgent than ever that we take advantage of this new federal funding in time for the general election.